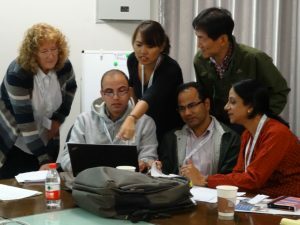 Participants applied techniques of systematic review to develop mini-Protocols focused on how traditional knowledge forest could inform current forest management strategies/policy. The workshop ran in an open, collaborative environment with shared learning and peer-to-peer support. This active participation helps build confidence in applying the techniques of systematic review and simulates the work of a real systematic review team in action. Evidence – what do we mean? Introduced collaborative systematic reviews and maps tools for robust evidence for policy and practice. What is the question? Introduced the importance of clear question-framing for research and reviews. Framing focuses on defining: POPULATION(S) that are subject to management interventions or environmental exposures; management or environmental INTERVENTIONS whose effects are either unknown or disputed; COMPARATORS or controls that enable judgments to be made about effects and impacts of management interventions; and clearly defined OUTCOMES that measure effect sizes and trends. How do we find the evidence? – Introduced the importance and challenges of comprehensive inclusion of relevant evidence and how to construct a good search strategy. What evidence do we include and exclude? – Introduced the importance of specifying explicitly what evidence is relevant to a particular review.